BARROW’S NOBLE RESPONSE TO THE CALL OF DUTY. The Winners of Mr. Arkwright’s Village Competition. ARKWRIGHT ENTERTAINS REPRESENTATIVES OF THE HEROES. The parents and wives of men from the village of Barrow-on-Trent who are serving with the colours were kindly entertained to tea by Mr. F. C. Arkwright, on Shrove Tuesday, when a party of between 50 and 60 assembled in the schoolroom representing all the 36 men who volunteered. 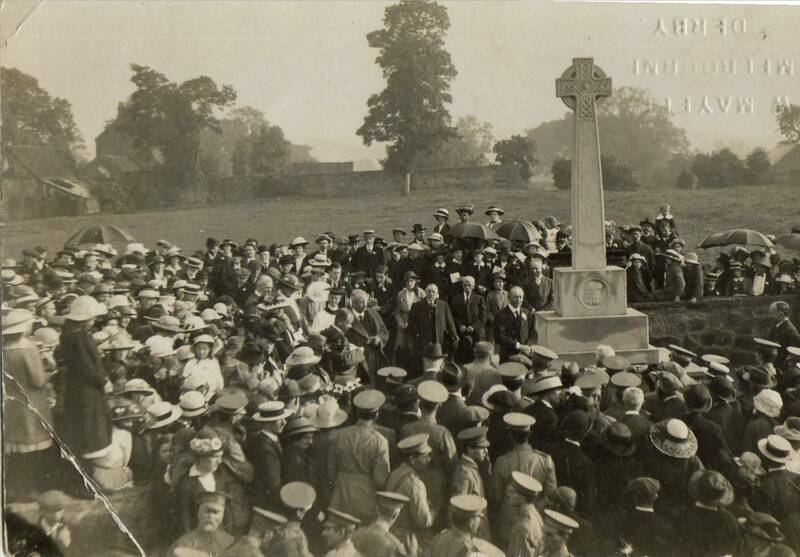 After a substantial tea and flash photos, the vicar introduced Mr. Arkwright, congratulating the village on winning the cross so kindly offered for competition among the Derbyshire villages. Mr. Arkwright then addressed the company, with congratulations on the noble response the village had made to the call of King and Country, saying though this was his first visit, he would always take an interest in Barrow, and hoped it would by no means be his last visit. The fact that Barrow was so far ahead of all the other competitors had made it an easy task for the judges to decide the winner. He also expressed his sympathy with those parents whose sons had already made the supreme sacrifice by giving their lives for others, a sympathy that was all the more heartfelt by reason of his own bereavement. He invited the parishioners to make suggestions as to what, when and where the memorial should be. Mr. Elkin (chairman of the Parish Council) said that a pleasure almost as great as that of winning the cross was that of making Mr. Arkwright’s acquaintance. Mr. Dobson, commanding the Home Guards, pointed out that, in addition to finding so many men for the colours, Barrow also had a platoon of Home Guards, who had given up a great deal of time to do their drill. The company was then entertained with songs by Mrs. Hoult, Mr. Martin Hoult, Miss Darby, and Mr. Fred Spencer, adding greatly to the pleasure of the evening. 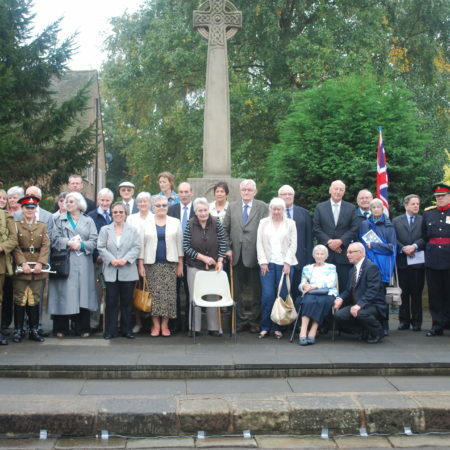 The vicar added that the object of having the photos taken was that a copy might be sent to all the men who are serving. He also regretted the unavoidable absence of Mr. Eadie and Mr. Bennett. After a few parting words from Mr. Arkwright, complementing Mrs. Robinson on the good effects of her teaching in school, 30 of the men having been pupils in former days, the proceeding closed with “God Save The King”. It will always be a pleasure to those who were present on this occasion to picture Mr. Arkwright in their midst, with a soldier’s child upon his knee endearing himself to everyone. Barrow is looking forward to a repetition of this pleasure in time to come. The Mr (Captain) Bennett mentioned above, had contacts in 1908 with Baden-Powell, founder of the Boy Scout movement and he then initiated the Barrow upon Trent scout troop, one of the first in the country. The question arises, was it this early introduction to ‘discipline’ present in the village that encouraged the men to enlist; was it really the good effects of Mrs Robinson’s teaching, or was it the combination that created this culture of patriotism? 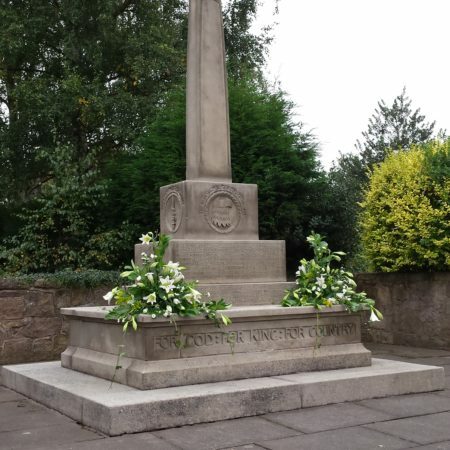 The memorial was created by W. Haswell and Son of Chester and London, stonemasons, and the tall Celtic cross stands on a stone plinth the panels of which depict the “Breastplate of Righteousness; the “Shield of Faith”; the “Helmet of Salvation” and the “Sword of the Spirit”. What is not known is whether the choice of these emblems was influenced by the knowledge that between 1165 and 1540, the Barrow village Church of St Wilfrid had belonged to the Knights Hospitallers. 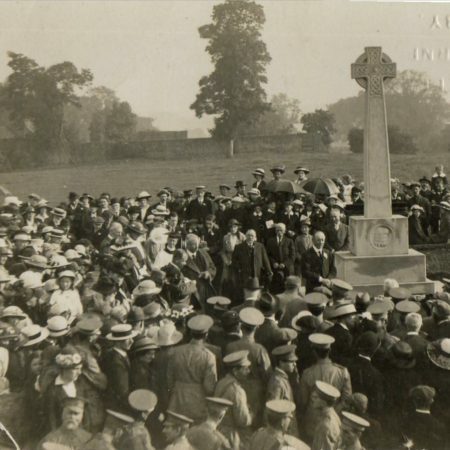 In 1916 the cross was presented by the then Duke of Devonshire and in 2014, the cross was re-dedicated by the present Duke of Devonshire representing his great-grandfather the 9th Duke; by Mrs Mary Rose Jackson representing her great-grandfather Mr Arkwright; by many other distinguished guests; by the local school children and by descendents of the men named on the cross. At the end of the war, 29 men whose names were celebrated on the cross returned home and 7 of the men had been killed. 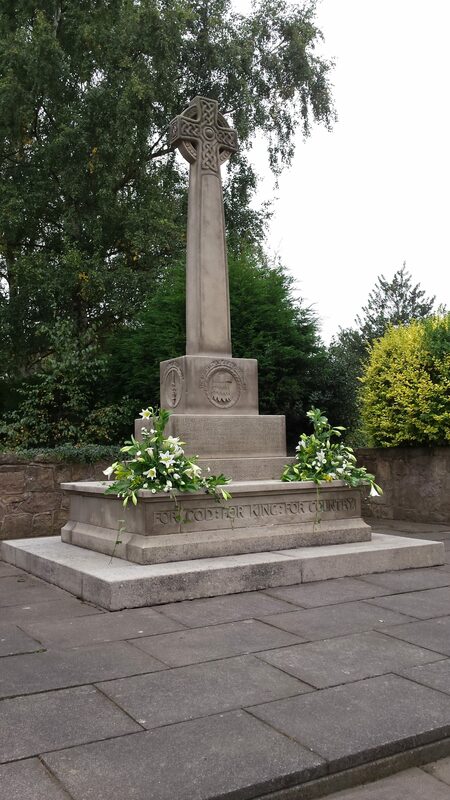 In 2016, the Parish unveiled another plaque with the names of the men of the village who volunteered after 1916 and whose names had not of course been included upon the main memorial cross. 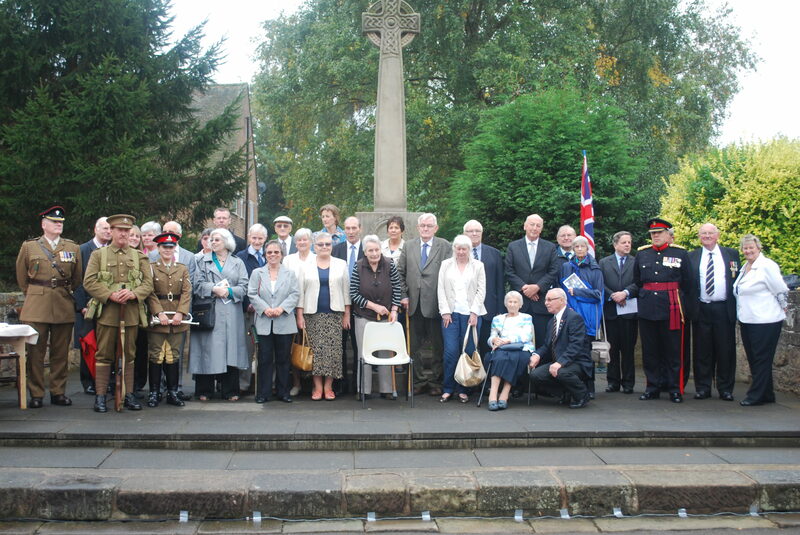 Unfortunately we do not have a copy of the photograph that was sent to the men at the front, but we do have a picture of the 9th Duke of Devonshire unveiling the cross in 1916 and also a picture of his great-grandson standing with descendents of the men who went to war, taken at its re-dedication in 2014.